The United Nations Environment Programme (UNEP) has released a report calling on mining companies to put people and the planet before profit. Mine Tailings Storage: safety is no Accident has been produced jointly by UNEP and the Norwegian foundation GRID-Adrenal. It highlights over 40 mining waste failures since 2008 that have killed some 341 people and is a call for action to nation-states and multinational mining corporations that increasingly call the shots. Brazil’s Samarco dam disaster in 2015 killed twenty of these 341 people. On 5 November 2015, at 3.30pm, in Brazil’s southeastern state of Minas Gerais, a Samarco upstream tailings dam – containing 56.4 million cubic metres of iron ore mud – burst, forcing 45 million cubic metres of the mining waste into the river system below. This generated mud waves of 10 metres high. The waves cascaded into streams that joined the vital Rio Doce river system, eroding sediment, vegetation and carrying other material from the river, later to be deposited on flood plains and stream channels. Besides the twenty people that lost their lives that day, 1.4 million were displaced and the entire Rio Doce river ecosystem was decimated, states The River is Dead, a new report by London Mining Network, an organisation that supports mining-affected communities. Samarco is a Brazilian mining company, it has two parent companies, Anglo-Australian BHP and Brazilian-owned Vale. BHP owns 50 percent of the Samarco iron ore operation in Brazil. It has a London headquarters and is listed on the London Stock Exchange. Its connection to the UK means that what happened to communities in Brazil is not an abstract humanitarian tragedy but is directly linked to the decisions made in suits behind desks in London. The UNEP report agrees: it recommends that mining companies must make environmental and human safety a priority in the management and operation of mining tailings. ‘Cost should not be the determining factor’, it stresses. Besides the 40 mining waste failures that have already happened, the report also points to thousands more of these tailings dams worldwide that pose a potential threat to people and the environment – disasters literally waiting to happen. ‘These risks present a challenge for this generation, and if not addressed now, a debt we will leave to future generations’, it says, urging governments and the mining industry to end deadly and damaging mining waste spills by enforcing a ‘zero-failure’ objective. An international coalition of organisations – Earthworks, MiningWatch Canada, Amnesty International Canada and London Mining Network – have welcomed the report. On a bleak Autumnal morning on Thursday 19 October, a group of around 30 community representatives, activists and members of UK-based solidarity organisations stood outside London’s Queen Elizabeth II Centre in the heart of Westminster to demonstrate ahead of mining company BHP’s annual general meeting that was being held there that afternoon. ‘We are here to announce that water should be for life and not for death’, said Thiago Silva in Portuguese, a Brazilian journalist who addressed the small crowd and a handful of journalists. Thiago is from one of the communities devastated by the Samarco disaster. 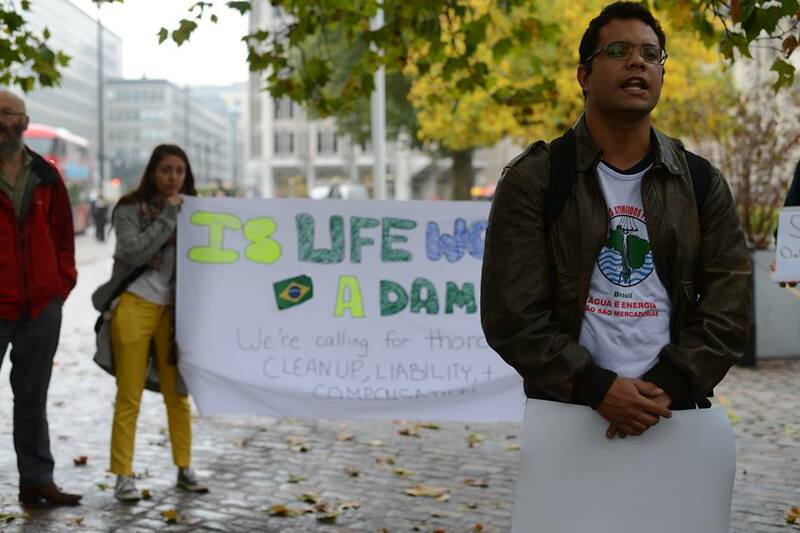 He was in London to represent his community and the Movement of the Affected by Dams (MAB) – a national movement in defence of human rights, water and energy – by attending the AGM and demanding justice from BHP. The second anniversary of the Samarco disaster was on 5 November. The 1.4 million men, women and children living along the River Doce are still looking for accountability from BHP, Samarco and the Vale. Many of the communities affected by the mining industry’s other 39 catastrophic mining waste failures in the past decade are also still waiting.